According to the old saying, death and taxes are the only things you can really count on. Although that might generally be true, there are some positive—highly likely— things to look forward to as well. Owning one’s dream vehicle is a good example, but now more than ever, getting it requires pulling more strings. The ability to transform any given make/model into a truly one-oﬀ custom version takes way more eﬀort than just walking into a dealer’s showroom and pointing at the prettiest vehicle on the lot. For anyone whose heart is set on an old, rusted pickup, there’s quite a bit of dirty work involved in transforming it into a running, driving, customized vehicle. The only sure thing you can expect from such a scenario, however, is that a fair amount of cash and hours will be spent resurrecting a dead or dying old truck. The odds favoring the owner/builder solely rest on his or her shoulders alone. Where there’s an unwavering will, there’s certainly a way. Lindsay Escoyne and her dad, Jason, are just the type of people who know how to stack the chips in their favor. Back in 2011, Jason purchased the ’71 Ford F-100 seen here from a Mr. Luke Pontiff Sr., who just happened to be the truck’s second owner. Lindsay reports that Mr. Pontiff knew the truck’s history inside and out, much more than would be expected from someone who wasn’t the original owner. “We aren’t too sure exactly what year Mr. Pontiff had purchased the truck, but he had used it as his basic mode of daily transportation. At some point in time, he spelled ‘Pontiff’ in mailbox lettering stickers underneath the window on the driver door. To this day, his name is still there. The truck has since taken on his name. It’s a way that I want to continue honoring him since he passed away not long after my dad bought the truck from him.” Lindsay and her dad are obviously sentimental folks who strongly believe in preserving legacy and tradition. 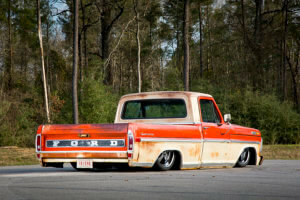 It’s this shared trait that kept the project on track during the 16 months they spent rehabbing Mr. Pontiff’s old truck. In an effort to preserve the truck’s natural patina, the entire exterior of the truck was sprayed with a semi-gloss clearcoat. 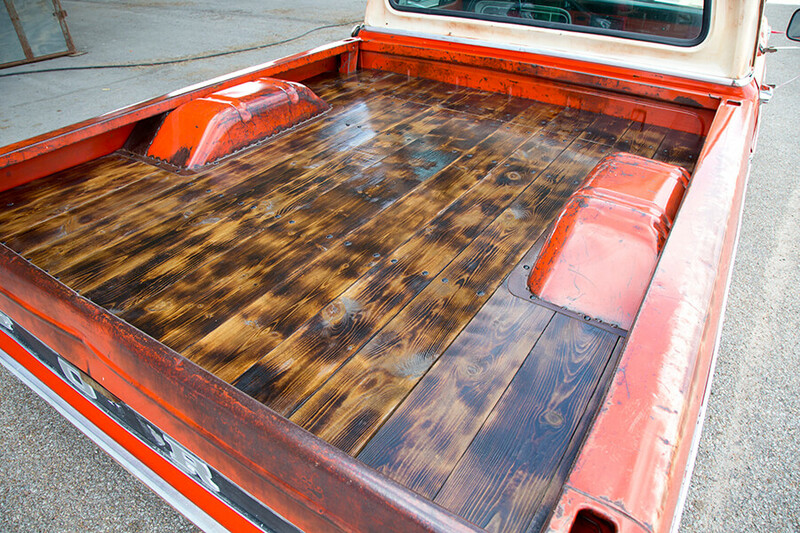 They could’ve left the truck to continue to age naturally, but encapsulating the finish under clear was a way of capturing a snapshot of the condition Mr. Pontiff last saw it in. 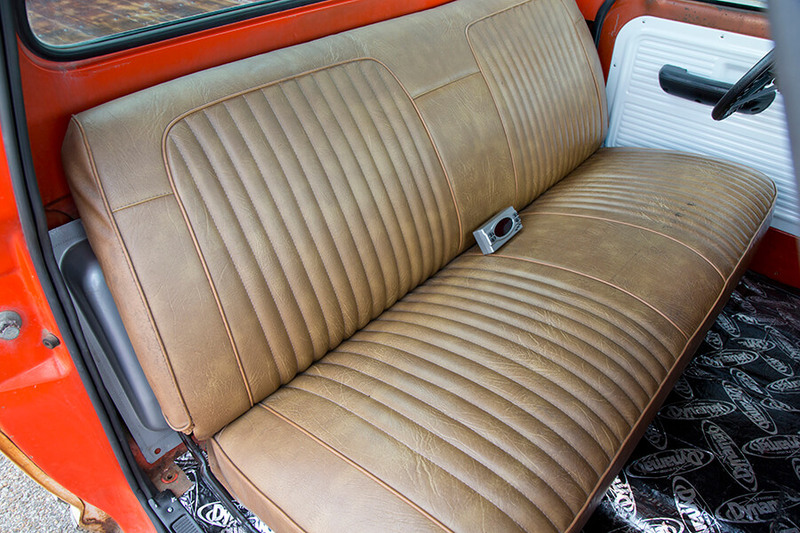 LMC truck’s seat cover helped clean up the Ford’s old bench. 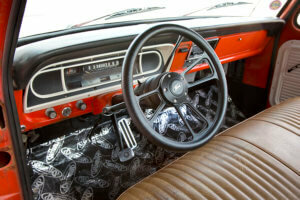 The 14-inch three-spoke steering wheel from LMC truck helps update the Ford’s interior space. Aside from Jason almost losing the tip of his finger while mocking up the access panel in the bed floor, the year-and-four-month build process flowed relatively smoothly. “The whole thing with my dad’s accident set us back maybe three weeks or so, but other than that we didn’t hit many other obstacles,” Lindsay recollects. 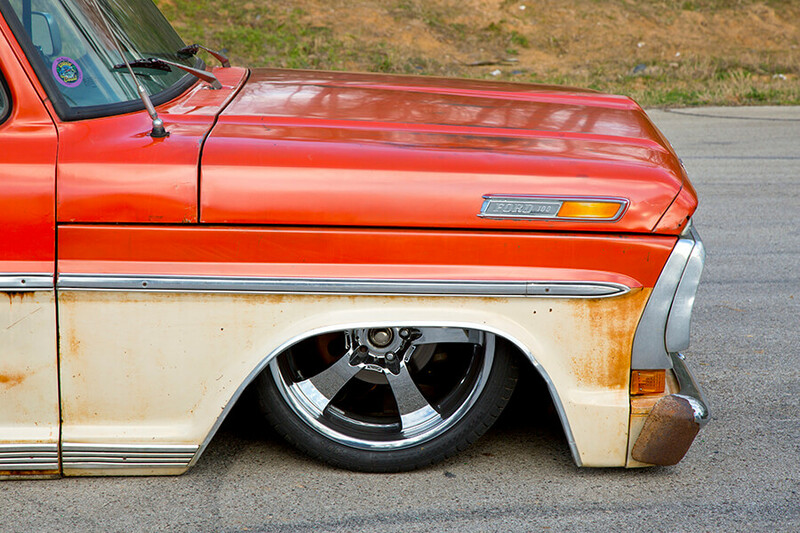 Jason set up the entire air ride system and raised the floor pan and bed to accommodate the adjustable suspension travel. 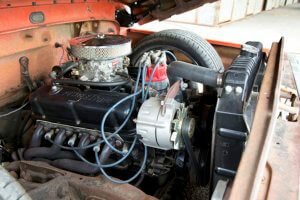 As far as a reliable power plant, they had their friend Scotty Thibodeaux rebuild a 1992 Thunderbird 5.0L V-8. The truck’s exterior is original for the most part, and the interior has only been treated to an LMC Truck bench seat cover, steering wheel and replacement 1969 door panels. Modifications were done with the utmost moderation. “When we were done with the truck, I drove it over to Mr. Pontiff’s family, so they could see what my dad and I had done with it. They were initially shocked to see the truck as low as it was, but they loved the fact that it still looked familiar to them. And they were pleasantly surprised to see their family name still spelled out in mailbox letters on the driver door.” Lindsay says. The 1992 Ford Thunderbird 5.0L engine that has been planted underneath the F-100’s hood keeps local highway patrol officers on their toes. With the old Ford back on the road with an extended lease on life, Lindsay can honestly say that the truck will be staying like this for the foreseeable future. 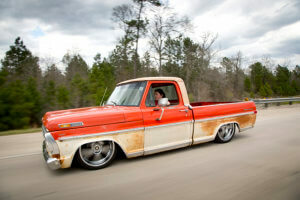 “I plan to fully restore the truck to its original condition, but that’s not going to be something that will happen all too soon. I love the response it is getting now,” she says. If it weren’t for her dad, Lindsay admits that she wouldn’t be able to say that she now knows her way around every inch of the truck and that she can recite every part that was used for the build and what was done to make something work. If it weren’t for Mr. Pontiff selling the truck to her old man, that experience wouldn’t have been possible, or at least not in the same way. For that, she has an unfathomable sense of pride and appreciation for these two important figures in her life. A custom wood bed floor has been pieced together and solidifies the truck’s barn-find appearance. 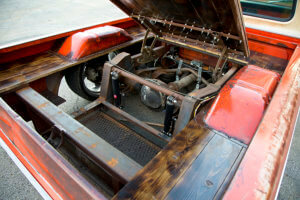 An access panel built right into the bed floor features hood hinges from a 1972 nova and a C-10 hood latch. 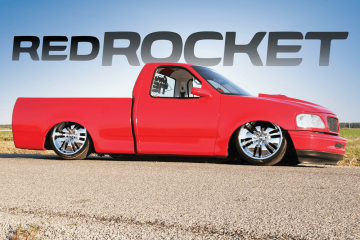 Editor’s Note: A version of this article first appeared in the September 2016 print issue of Street Trucks.